I’ve been back on the foundation testing train (first scheduled stop, Dior’s new Forever Perfect Mousse, toot-toot!) but before I hit you with a slew of in-depth reviews, let’s talk about the chunky brush I’ve been applying my bases with for the past few months. Earlier this year Rodial launched a set of very, very pigmented foundations called Airbrush Makeup* and the Airbrush Foundation Brush* is their purpose-built application tool. Its incredibly dense and chunky brush head gives – as you’d hope from the name – a flawless, airbrushed finish. 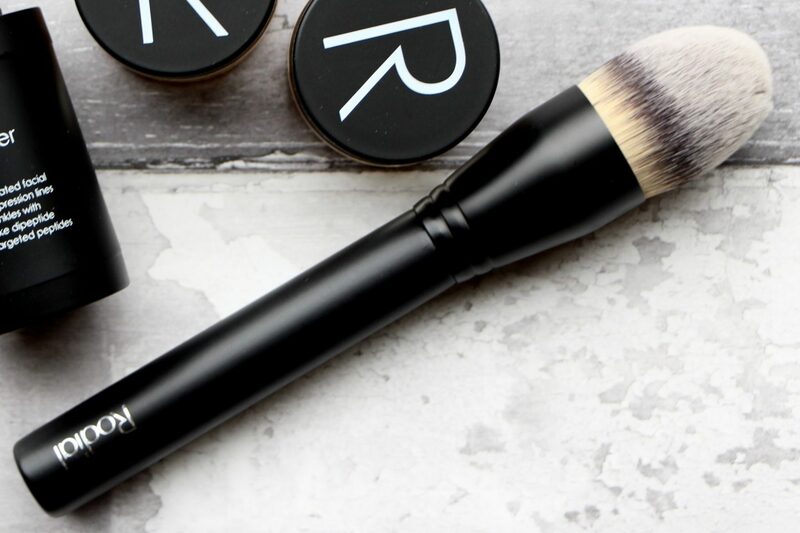 The brush is also very good looking, which is why I think that it attracts so many comments and questions every time I feature it – the sleek black styling is chic and luxurious, the shape of the brush head looks very professional. I actually don’t love the Airbrush foundations themselves; I find them a little too pigmented to work with, even when diluted and sheered out with a few drops of oil, as suggested in the instructions. 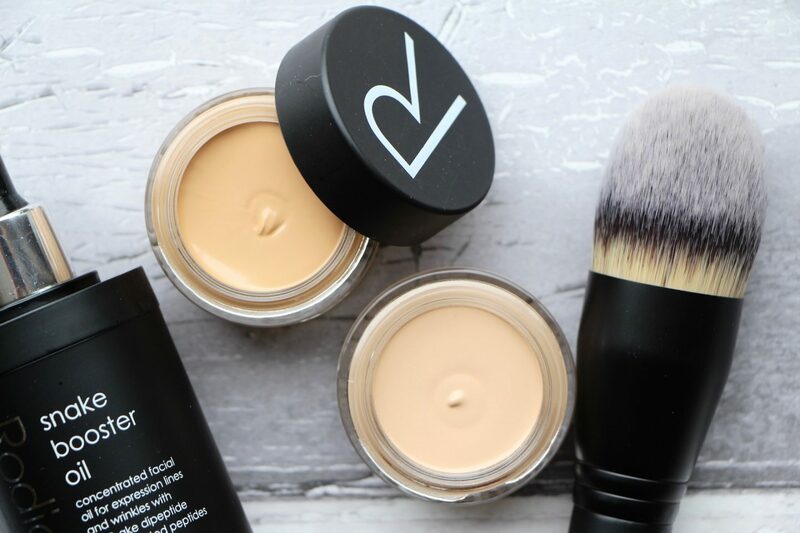 If you want a very buildable base that’s more the consistency of a concealer than a foundation then you might get on well with it – just make sure to use a tiny bit of product at a time and work carefully. It’s not the sort of foundation you can just bash on in thirty seconds before you rush out of the door, it needs more of a considered approach. Which isn’t particularly my forté, I’ll admit! The brush, however, is totally up my street. The bristles are so densely packed that there’s barely any flex or movement at all to the head, the domed shape with a tapered tip means that it’s possible to accurately apply concealer as well as cover larger areas of the face. It’s so firm that it’s a dream to use with cushion foundations – I just push it into the product and then sort of stipple it on – but the brush is also incredibly soft, and if you use the sides of the dome rather than the very tip, it’s easy to get a smooth, seamless finish. The dense packing-together of the bristles means that you can achieve the same sort of airbrushed perfection that you would get from a flatter-headed buffing brush, but the tapering at the tip of this one gives far more options in terms of application. It reminds me a lot of Louise Young’s excellent LY34 brush (£24 here* and a great alternative to the Rodial) – the same dense, firm head that applies foundation quickly and faultlessly, and a similar sturdy handle that feels expensive and weighty. Strictly speaking, the Rodial Airbrush brush (brush) is a bit too chunky to do close work around the eyes or very detailed spot concealing, but it’s brilliant for just about every other aspect of applying a perfect base. 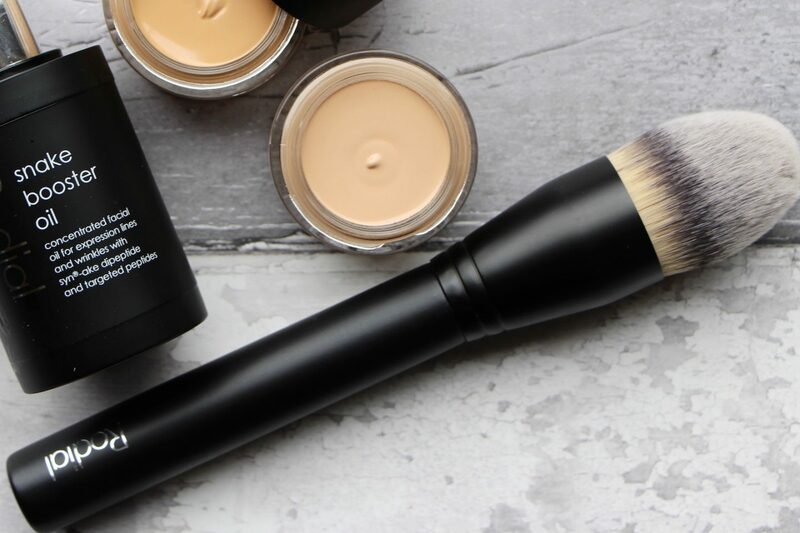 Foundation with an undetectable finish, concealer that sits seamlessly over the top to camouflage circles or redness; even setting powder can be dabbed on with the very tip of the brush. In one (admittedly rather expensive) go, it lays on foundation, blends, buffs, stipples, conceals and sets, which is why I’ve been using it almost constantly for the past few months. You can find Rodial’s Airbrush Foundation Brush online here* – it’s £50, which is quite the outlay, but I must say that it does very much feel and look the part. I’m still hugely into Bobbi Brown’s Full Coverage Brush, which is £33 here*, but the Rodial is definitely more of a multitasker. And it feels so chunky and confident, I always feel as though I’m sort of gently punching my makeup on a little bit, punch-punch-dab-dab, with a tiny, soft, bristly boxing glove!